(CNN) -- Home hope Rory McIlroy recovered from a poor start to card a challenging three-under-par 69 in the first round of Irish Open at County Louth. 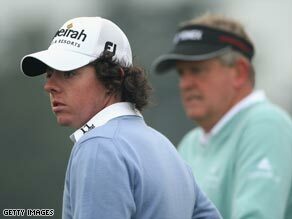 McIlroy was paired with European Ryder Cup captain Colin Montgomerie in the first round. The 20-year-old is earmarked as one of the stars of the future after his win in this year's Dubai Desert Classic but caused a stir when he said that claiming a place on the Ryder Cup team was "not a huge goal of mine." McIlroy admitted he had lacked inspiration in two tournaments following the excitement of his U.S. Masters debut, but was pumped up by the large gallery following his group in Ireland and was satisfied with his round. "Hopefully it can set me up for the rest of the week," he told Sky Sports. Dougherty, who slipped out of Ryder Cup contention after the death of his mother from a heart attack last season, was pleasantly surprised by the conditions after predictions of bad weather. "Apart from the fact that it was very cold at the start it was a pleasant surprise and you feel a bit more positive about what you can achieve." But defending champion Richard Finch, who made headlines last year when he fell into a stream playing his approach shot to the 18th on the final day, could do no better than a 73, while Northern Ireland's Graeme McDowell had a 77. Big names John Daly, Padraig Harrington and Lee Westwood were among the later starters on Thursday.